vyatītāḥ—after passing; katicit—a few; māsāḥ—months; tadā—at that time; na āyāt—did not return; tataḥ—from there; arjunaḥ—Arjuna; dadarśa—observed; ghora—fearful; rūpāṇi—appearances; nimittāni—various causes; kuru-udvahaḥ—Mahārāja Yudhiṣṭhira. When a few months had passed, and Arjuna had not returned from Dvaraka, Maharaja Yudhisthira began to observe some inauspicious omens. Lord Śrī Kṛṣṇa the Supreme Personality of Godhead is ad infinitum, more powerful than the most powerful sun of our experience. Millions and billions of suns are created by Him and annihilated by Him within His one breathing period. In the material world the sun is considered to be the source of all productivity and material energy, and only due to the sun can we have the necessities of life. Therefore, during the personal presence of the Lord on the earth, all paraphernalia for our peace and prosperity, especially religion and knowledge, were in full display because of the Lord's presence, just as there is a full flood of light in the presence of the glowing sun. 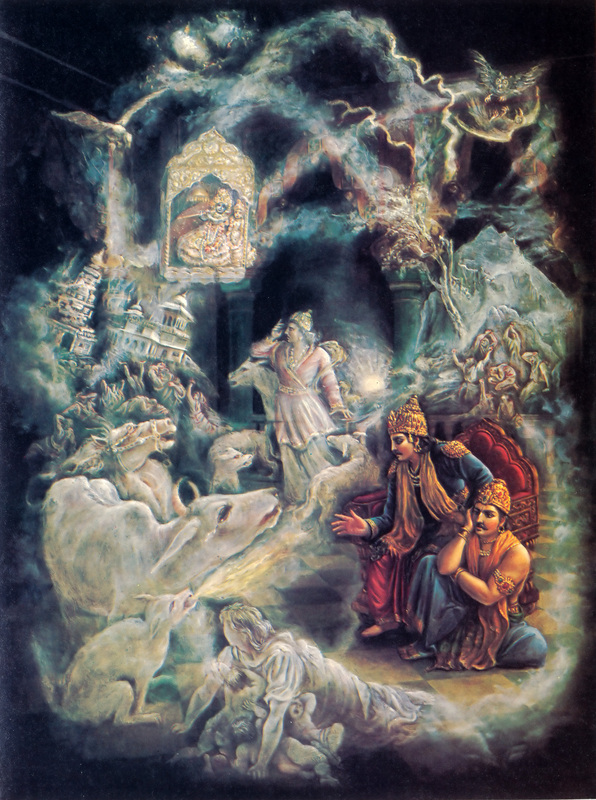 Mahārāja Yudhiṣṭhira observed some discrepancies in his kingdom, and therefore he became very anxious about Arjuna, who was long absent, and there was also no news about Dvārakā's well-being. He suspected the disappearance of Lord Kṛṣṇa, otherwise there would have been no possibility of fearful omens.